The 123 Get Scrappy board was an easy one this time; whilst in QLD for my friends wedding I took the opportunity to also spend time with my niece and her little family. We don't get the chance to catch up often as we are on completely opposite sides of the country. You may recognise the family in these photos; my niece Bel is DT for this site. 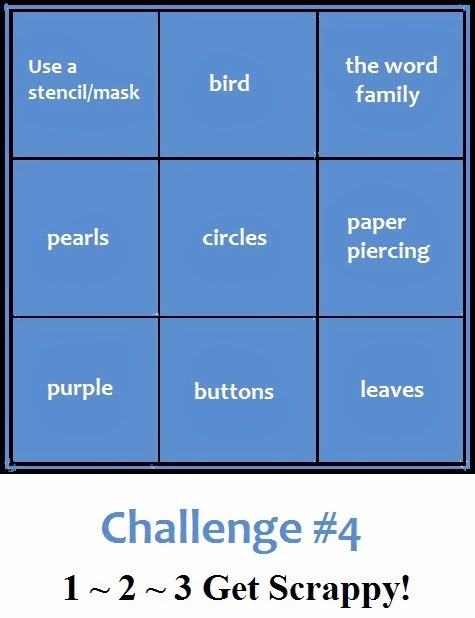 I chose the top three across; mask/stencil, bird, 'family'. I haven't spent time with Bel since her last trip home and she has added to her family since that last meeting. I was able to stay the night with her and spend some quality time getting to know the children, watch how they interact and playing some serious xbox; a first for me! What I learnt very quickly was that this young lady is an awesome, very organised, loving Mum who with her lovely husband are bringing up some truly beautiful, well mannered little people. We took some selfies just before I left for the airport; the littlest one was fast asleep in his cot. Oh I love how you have used these photos!! You used super small ones!! Yay and they are good selfies!! Thanks for all your lovely comments on my family, we loved having you stay. Ok so I love the stitching( as always) and those birds are too cute! Very cute! Love the cameras with the little hearts in the lens. Such a lovely page! I love a lot of photos on a page! Thanks for joining us @ 1-2-3 Get Scrappy! Love this!! 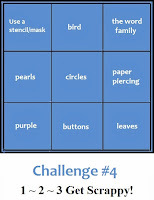 Love the stencil and the tic tac toe pattern of the pictures. Awesome! Thanks for playing along at 123 Get Scrappy! This is fabulous! Love the chevron stencil and design! Great job! Thanks for joining us over at 123 Get Scrappy! Kraft it Up - November Challenge...not!